Make sure you have reserved your room for this fabulous annual event in Lytham. "The first headliners will be electronic new wave band The Human League on Wednesday. The Human League will be supported by the Voice of M People Heather Small with pop-rock band China Crisis opening the show in the Main Proms Arena." One of the biggest guitar bands of the 90s and 00s - playing new hits and old. "Globally celebrated superstar Kylie will headline on Friday, performing a series of career-spanning hits from her unparalleled back catalogue. Brit singer-songwriter Sophie Ellis Bextor will support and Radio 2 DJ Ana Matronic will warm up the crowd." "Saturday night will see legendary rock superstar Rod Stewart headlining with his unique voice and styling bringing a show which promises to be filled with both classics and new hits in his dazzling signature style." 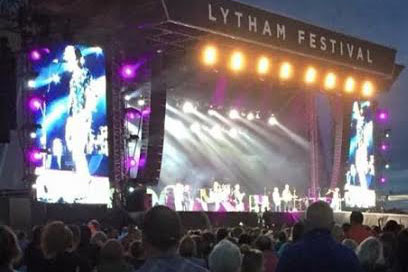 "Lytham Festival will close on the Sunday with a glittering and dazzling Hollywood Proms finale featuring a host of musical theatre stars. Headliners Sheridan Smith and Michael Ball are already confirmed with more names to follow."